During the 1980s Anish Kapoor, along with his British counterparts Richard Deacon, Tony Cragg, Antony Gormley and others, significantly challenged prevailing sculptural practices. 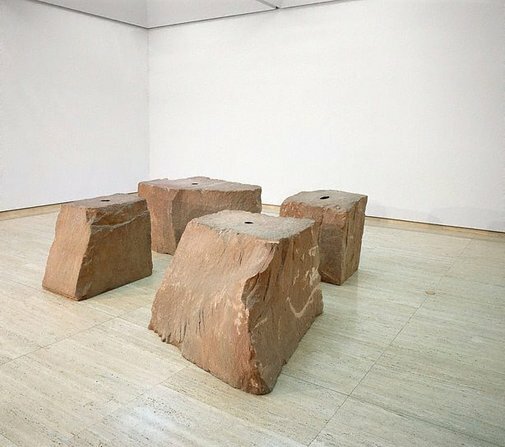 Referred to as New British Sculpture, their respective work (although largely unrelated) shifted away from the purely conceptual or minimal art that had dominated the previous decades to embrace lyricism and metaphor, and to reconfigure the relationship between subject, object and viewer. Kapoor was an influential figure in this development. From brightly coloured pigments spread over abstract bodily forms to concave mirror pieces and enormous sculptural installations, Kapoor’s sculpture is about sensory experiences. He makes sculptural forms which pervade or hold physical space and which deliberately explore metaphysical dualities such as light and darkness, earth and sky, mind and body. For Kapoor, space is not empty; rather it is full of meaning and potential, and it is this paradox that he explores in material and abstract terms. Since the 1990s Kapoor’s work has been concerned with the expression of negative space: openings and cavities which are often referred to as voids. While his earlier pigment works were shapes with luminously coloured surfaces, ‘Void field’, a sculptural installation of four craggy blocks of quarried Northumbrian sandstone, elaborates an internal space of darkness. At the centre of each stone is a deep velvety hole coated with black pigment, which figuratively signifies a threshold, a space that portends to infinity. Peering into the aperture of each stone, the space within appears beyond measure, revealing a balanced tension between the earthly weight of rock and the nothingness suggested by the dark opening, or void. Kapoor’s voids have been likened both to wombs and to contemporary notions of the sublime. About his understanding of a ‘modern sublime’ Kapoor has said: ‘I have always been drawn toward some notion of fear in a very visual space, towards sensations of falling, of being pulled inwards, of losing one’s sense of self’.1 The black holes at the centre of each stone in ‘Void field’ function in this way; their darkness is conspicuous and entrancing, denoting the amorphous margins between human perception and cognition. Similar sensations are invoked by Kapoor’s suite of prints ‘Blackness from her womb’ 2001 (AGNSW collection). Here, the void is literally associated with the womb, whose function is to harbour life. The yellows and reds that dominated Kapoor’s early work return, transformed more obviously into abstracted female sexual iconography. The aquatint bleeds into forms, dissolving and sometimes imploding their structure. In the unresolved play and metamorphosis between interior and exterior spaces and darkness and light, ‘Blackness from her womb’ is a graphic synthesis of Kapoor’s ideas. Anthony Bond, Look , 'Rehang of Level 2 June 2012', pg.28-30, Sydney, May 2012, 31. Anthony Bond and Victoria Lynn, AGNSW Collections , 'Contemporary Practice - Here, There, Everywhere ...', pg. 229-285, Sydney, 1994, 255 (colour illus.). Natasha Bullock, Contemporary: Art Gallery of New South Wales Contemporary Collection , 'Landscape, mapping, nature', pg.290-331, Sydney, 2006, 314, 315 (colour illus.). Bruce James, Art Gallery of New South Wales handbook , 'Western Collection: Paintings and Sculpture', pg. 17-77, Sydney, 1999, 77 (colour illus.). Bernard Rigby, Look , 'Inside Void field: much ado about nothingness', pg.10, Sydney, Jul 2002, 10 (colour illus. ).